(CNN) -- Sri Lanka's president declared Wednesday that the country's Tamil insurgents are on the verge of total defeat, saying their demise has helped unite the island nation on the 61st anniversary of its independence. "We are today a nation that has defeated a powerful enemy that stood before us," Mahinda Rajapaksa said in his independence day speech. "Our entire nation is now united in the shade of the national flag." 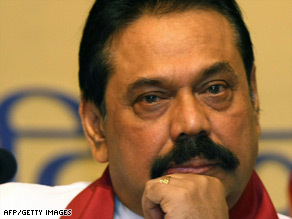 But in other parts of his speech, Rajapaksa indicated that the fight against the Tamil Tiger rebels was not over. In another part of the speech, he said, government forces over the past two and a half years have "been able ... to almost completely defeat" the rebel forces. Aid agencies have asked for increased access to the region, calling conditions in northern Sri Lanka a nightmarish situation. The fighting has forced the closure of Pudukkudiyiruppu hospital in the Vanni region, the last functioning medical facility in the conflict zone.